, a great philosopher and historian of antiquity, who lived from the reign of Claudius to that of Adrian, was born at Chaeronea, a small city of Bceotia, in Greece, which had also been the birth-place of Pindar, but was far from partaking of the proverbial dulness of his country. 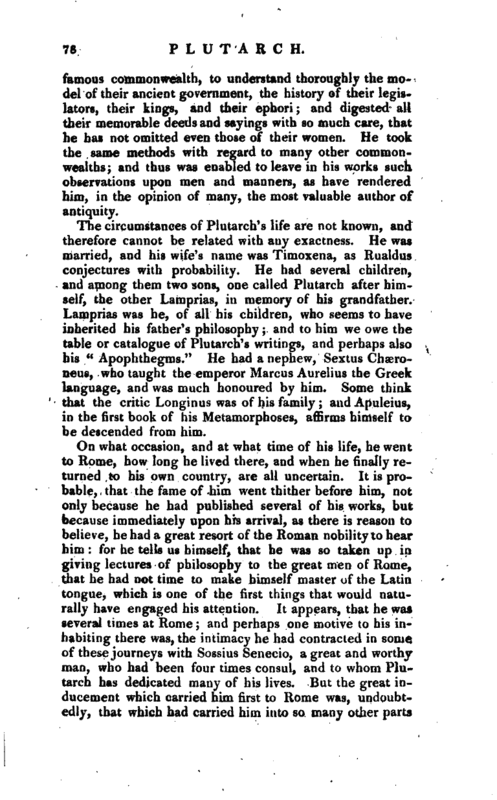 Plutarch’s family was ancient in Chaeronea: his grandfather Lamprias was a man eminent for his learning, and a philosopher; and is often mentioned by Plutarch in his writings, as is also his father. Plutarch was initiated | early in study, to which he was naturally inclined; and was placed under Ammonius an Egyptian, who, having taught philosophy with reputation at Alexandria, thence travelled into Greece, and settled at Athens. Under this master he made great advances in knowledge, but being more intent on things than words, he neglected the languages. The Roman language at that time was not only the language of ‘Rome, but of Greece also; and much more used there than the French is now in England. Yet he was so far from regarding it then, that, as we learn from himself, he did not become conversant in it till the decline of life; and, though he is supposed to have resided in Rome near forty years, at different times, he never seems to have acquired a competent skill in it. After he had received his first instructions from Ammonius, he considered with himself, that a larger communication with the wise and learned was yet necessary, and therefore resolved to travel. Egypt was, at that time, as formerly it had been, famous for learning and probably the mysteriousness of their doctrine might tempt him, as it had tempted Pythagoras and others, to converse with the priesthood of that country. This appears to have been particularly his business, by his treatise “Of Isis and Osiris,” in which he shews himself versed in the ancient theology and philosophy of the wise men. From Egypt he returned into Greece; and, visiting in his way all the academies and schools of the philosophers, gathered from them many of those observations with which he has abundantly enriched posterity. He does not seem to have been attached to any particular sect, but chose from each of them whatever he thought excellent and worthy to be regarded. He could not bear the paradoxes of the Stoics, but yet was more averse to the impiety of the Epicureans in many things he followed Aristotle but his favourites were Socrates and Plato, whose memory he reverenced so highly, that he annually celebrated their birth-days with much solemnity. 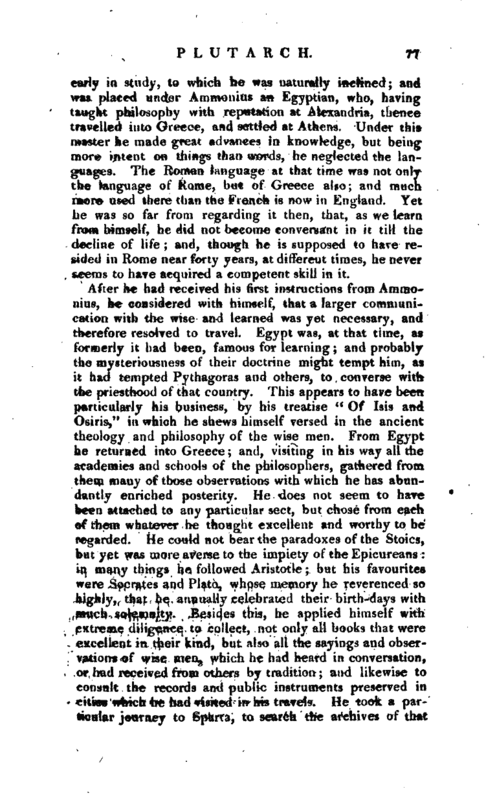 Besides this, he applied himself witri extreme diligence to collect, not only all books that were excellent in their kind, but also all the sayings and observations of wise men, which he had heard in conversation, or had received from others by tradition and likewise to consult the records and public instruments preserved in cities which he had visited in his travels. He took a particular journey to Sparta, to search the archives of that | famous commonwealth, to understand thoroughly the model of their ancient government, the history of their legislators, their kings, and their ephori; and digested all their memorable deeds and sayings with so much care, that he has not omitted even those of their women. He took the same methods with regard to many other commonwealths; and thus was enabled to leave in his works such observations upon men and manners, as have rendered him, in the opinion of many, the most valuable author of antiquity. The circumstances of Plutarch’s life are not known, and therefore cannot be related with any exactness. He was married, and his wife’s name was Timoxena, as Rualdus conjectures with probability. He had several children, and among them two sons, one called Plutarch after himself, the other Lamprias, in memory of his grandfather. Lamprias was he, of all his children, who seems to have inherited his father’s philosophy; and to him we owe the table, or catalogue of Plutarch’s writings, and perhaps also his “Apophthegms.” He had a nephew, Sextus Chseroneus, who taught the emperor Marcus Aurelius the Greek language, and was much honoured by him. Some think that the critic Longinus was of his family; and Apuleius, in the first book of his Metamorphoses, affirms himself to be descended from him. His works have been divided, and they admit of a tolerably equal division, into “Lives” and “Morals:” the former of which, in his own estimation, were to be preferred, as more noble than the latter. As a biographer he has great merit, and to him we stand indebted for much of the knowledge we possess, concerning several of the most eminent personages of antiquity. 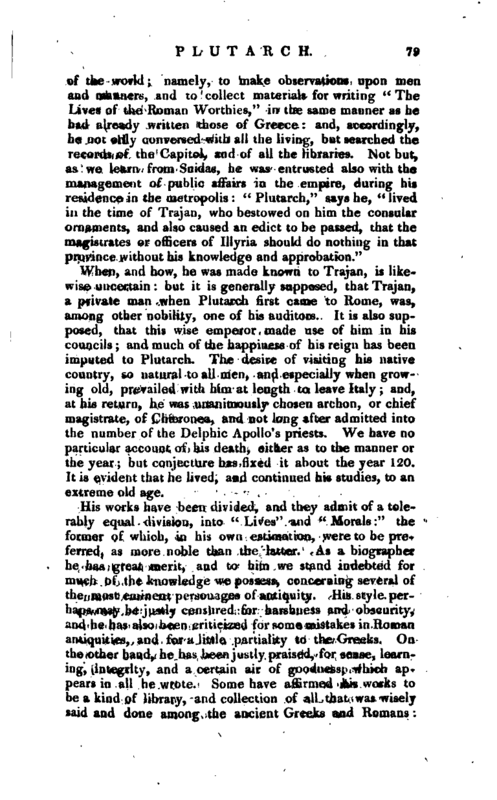 His style perhaps may be justly censured for harshness and obscurity, and he has also been criticized for some mistakes in Roman antiquities, and for a. little partiality to the Greeks. On the other hand, he has been justly praised, for sense, learning, integrity, and a certain air of goodness, which appears in all he wrote. Some have affirmed his works to be a kind of library, and collection of all that was wisely said and done among the ancient Greeks and Romans: | and if so, the saying of Theodorus Gaza was not extravagant. 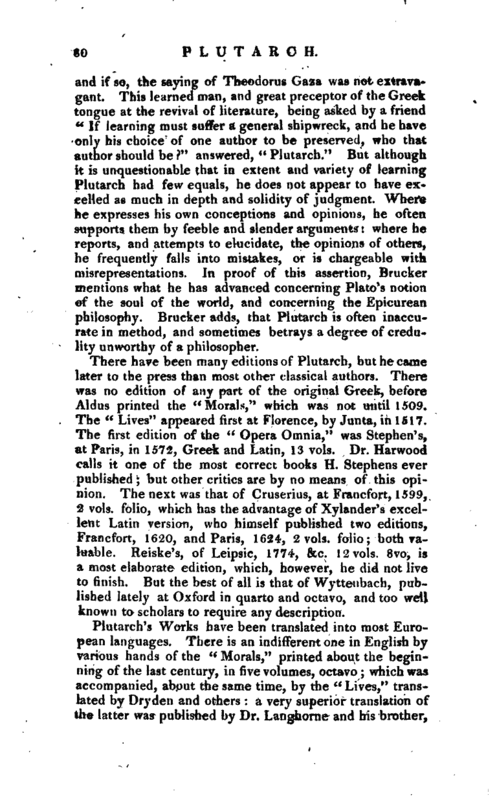 This learned man, and great preceptor of the Greek tongue at the revival of literature, being asked by a friend “If learning must suffer a general shipwreck, and he have only his choice of one author to be preserved, who that author should be?” answered, “Plutarch.” But although it is unquestionable that in extent and variety of learning Plutarch had few equals, he does not appear to have excelled as much in depth and solidity of judgment. Where he expresses his own conceptions and opinions, he often supports them by feeble and slender arguments: where he reports, and attempts to elucidate, the opinions of others, he frequently falls into mistakes, or is chargeable with misrepresentations. In proof of this assertion, Brucker mentions what he has advanced concerning Plato’s notion of the soul of the world, and concerning the Epicurean philosophy. Brucker adds, that Plutarch is often inaccurate in method, and sometimes betrays a degree of credulity unworthy of a philosopher. 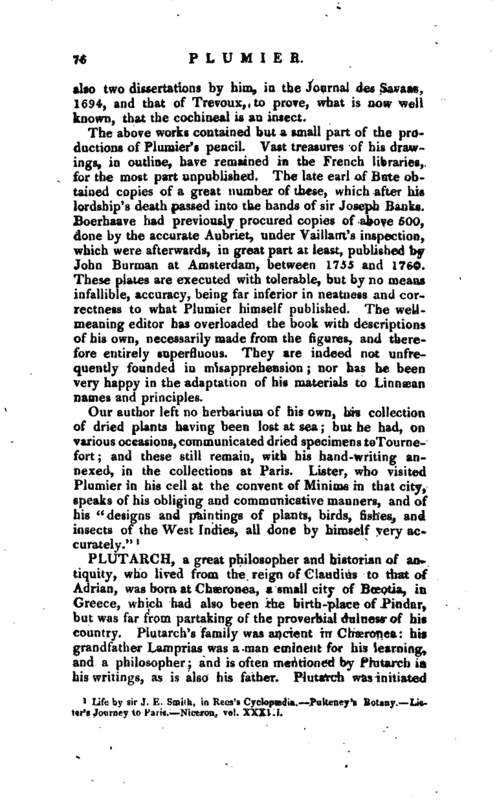 There have been many editions of Plutarch, but he came later to the press than most other classical authors. There was no edition of any part of the original Greek, before Aldus printed the “Morals,” which was not until 1509. The “Lives” appeared first at Florence, by Junta, in 1517. The first edition of the “Opera Omnia,” was Stephen’s, at Paris, in 1572, Greek and Latin, 13 vols. Dr. Harwood calls it one of the most correct books H. Stephens ever published; but other critics are by no means of this opinion. The next was that of Cruserius, at Francfort, 1599, 2 vols. folio, which has the advantage of Xylander’s excellent Latin version, who himself published two editions, Francfort, 1620, and Paris, 1624, 2 vols. folio; both valuable. Reiske’s, of Leipsic, 1774, &c. 12 vols. 8vo, is a most elaborate edition, which, however, he did not live to finish. 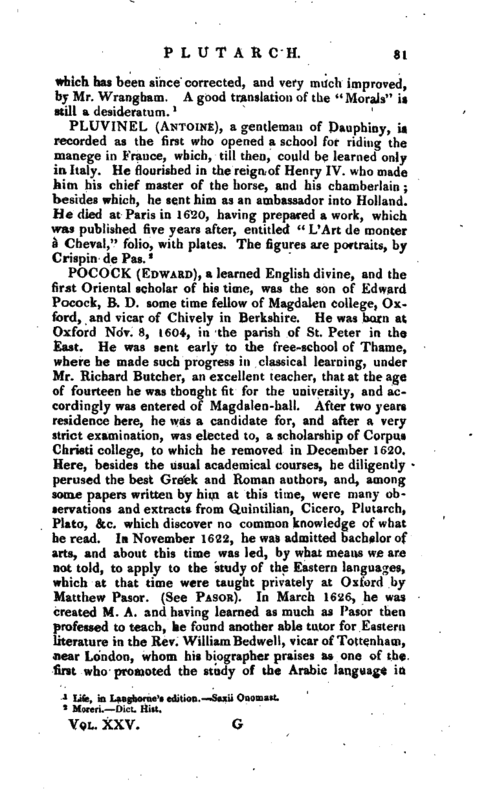 But the best of all is that of Wytteubach, published lately at Oxford in quarto and octavo, and too well known to scholars to require any description. Life, in Langhorne’s edition, —Saxii Onomast.